Charles Creed was born into a tailoring family with an enviable reputation stretching back into eighteenth-century London. A branch of Creed was established in Paris in 1850, and the company became known for impeccably crafted 'tailor-mades' for women. Charles Creed set up his own fashion house in London after the Second World War, and enjoyed success in America and London. Creed's work was characterised by a military precision that owed much to the techniques of traditional men's tailoring. 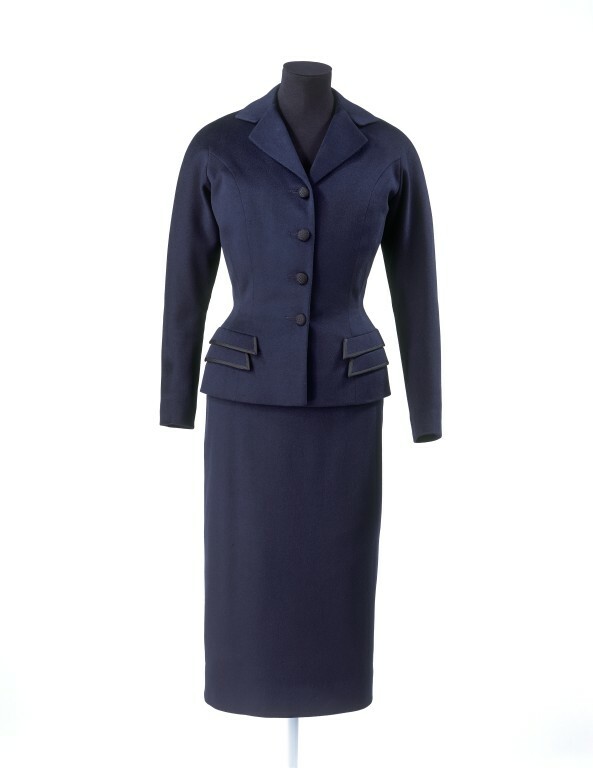 Here Savile Row detailing forms the basis of a very feminine suit, perfect for the lunch and shopping excursions that were the focus of many upper- class women's lives. 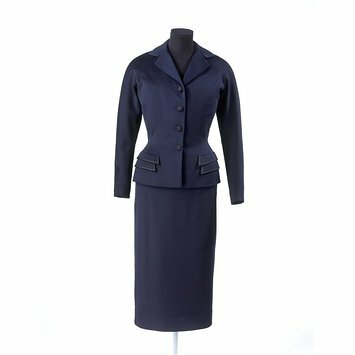 Ladies suit consisting of a jacket and skirt of navy blue fine wool. The jacket is fitted and hip-length with a single-breasted four-button fastening, and wide lapels which overlap and are not stitched where they join. The shoulders are rounded and cut in one with the jacket. On the hips there are two over-lapping dummy pocket flaps, bound with black silk braid. There is a line of the same braid inserted down the outside seam of each sleeve from collar to cuff. The buttons are of black basket weave silk. The jacket is lined with navy crêpe de chine. The skirt is straight with a similar line of braid set into the side seams. There is a white petersham waist band fastening on the left side with two hooks. The placket, which is concealed on the left hip, fastens with hooks and eyes and snap fasteners. It is unlined. Creed and Worth were important names in Paris in the 19th century, but both were English in origin. Charles Creed, a descendent of the founder, left the family business and opened his own house in London. He lamented the lack of skilled needlewomen in England, saying, 'French girls are born with threads of sewing silk running in their veins'.